White with Sierra Brown trim? Southwestern Sand with Irish Linen trim? Harbor with Clipper Gray trim? Because vinyl siding is available in such a broad palette of colors--from aspen white to cabin dark brown--and with hundreds of trim and accent options, deciding on the color combination for your home can be both exciting and daunting. Ask your supplier or manufacturer for a color guide and use it. For example, Vytec, a vinyl siding manufacturer, offers one online. With it, you can look at groupings of light, medium and dark color combinations. You'll probably figure out immediately which of these groups appeals to you the most. From there, you can select your roof color from the available options--dark gray, brown/red, medium gray, medium brown, black and dark brown. Key in on the color combinations that go well with your roof color in your favorite group (light, medium or dark). Ask your contractor or supplier to show you samples of the colors you like best. Examine those potential colors outside in the natural light rather than indoors and during different conditions--direct sunlight, an overcast sky and lamp illumination only. This will give you a good idea of what the colors will look like in their true environment. When you've narrowed the choices to a reasonable number, ask your contractor or supplier for a list of homes with those colors in your neighborhood. View the homes to see how the colors look on a grand scale. Consider whether you'll be happy with your selections one, two, three or more decades from now. Vinyl siding can last a long time. 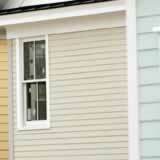 Nearly 350 vinyl siding colors meet ASTM International standards for color retention. Your siding should retain its original color 20 or 30 years down the line despite varying climate conditions and the passage of time.